I first decided to go to Borneo because it seemed like it was “the next Thailand.” With alluring South Pacific features like beaches, water sports, islands, and wildlife, the two destinations seemed similar from where I was sitting on the other side of the world. But I was more drawn to Borneo for having fewer tourists, and because many American travelers don’t even know where Borneo, the world’s third largest island, is. And while Americans might not know about Borneo as a tourist destination, plenty of travelers from other places around the world do: During my 12-day trip on Intrepid Travel’s Sabah Adventure tour in Malaysian Borneo, I realized that Borneo was well on its way to becoming the next Thailand—and not in a good way. After experiencing the crowds, pollution, and exploitation in Thailand first-hand years ago, and with parts of Thailand now even closing due to overtourism, I changed my perspective. Borneo could be the next Thailand, but travelers shouldn’t want it to be. In the island of Borneo’s Malaysian state of Sabah, tourism is heavily reliant on wildlife. The region often referred to as the “last wild frontier” for its native species like orangutans, proboscis monkeys, hornbills, kingfishers, pygmy elephants, and sun bears—and many tour operators advertise this heavily, accordingly. But like many other developing states, Sabah is experiencing environmental problems like trash pollution in the ocean, birds nest collecting, and deforestation. Now more than ever, travelers need to understand the environmental impact of their trips and how to practice social responsibility while abroad. Here’s how to do it in Malaysian Borneo. My Borneo travel was organized by Intrepid Travel, which educates travelers about Borneo’s environmental issues and supports the incredible natural wildlife that its groups might be lucky enough to see. Intrepid supports the HUTAN Kinabatangan Orangutan Conservation Program in Malaysian Borneo and encourages travelers to use reusable water bottles when they can to decrease plastic pollution. My itinerary explained the environmental strain created by Borneo’s palm oil plantations. Palm oil is a type of vegetable oil used in food and beauty products, and Intrepid encourages travelers to shop for products with an RSPO (Roundtable on Sustainable Palm Oil) and/or FSC (Forest Stewardship Council) label, which signify that a product is sourced responsibly. Intrepid’s Sabah Adventure itinerary includes Borneo highlights like climbing Mt. Kinabalu and cruising the Kinabatangan jungle. Intrepid works with responsible local tour operators, so travelers know each activity is helping and not hurting the environment and people. Other responsible group tour operators that offer Borneo trips include G Adventures, Amazing Borneo, and Intrepid-owned Geckos Adventures and Peregrine Adventures. There are close to 30 national parks in Malaysian Borneo, with many travelers fitting in just a handful of them. While there is infrastructure in place to control the number of visitors, it’s worth visiting the lesser-known but equally beautiful ones, like Lambir Hills National Park, Danum Valley, and Tun Sakaran Marine Park. Visiting national parks ensures you’re abiding by local conservation guidelines, have supervision, and are financially supporting the land through admission fees. There are plenty of opportunities to enjoy wildlife in Malaysian Borneo, but you can go one step further by helping with wildlife conservation in the Borneo rainforest and beyond. Australian tour company Orangutan Odysseys offers a fundraiser tour where travelers raise $1,000 AUD (about $700 USD), in addition to the tour cost, which goes towards adopting orphaned orangutans and directly contributes to the survival of both orangutans and their habitat. My Intrepid tour group visited Turtle Island, which is a national park and protected hatchery that supports sea turtle conservation, and travelers can “adopt” a turtle nest by donating funds. There are of course many other meaningful ways you can volunteer if you do your research: The U.K.’s Tourism Concern initiative and Ethical Travel Guide are good places to start if you’re serious about voluntourism in Borneo. The state of Sabah has a unique homestay program funded by the Ministry of Tourism Malaysia so travelers stay in a host family’s home for one night. Some tour operators include this on their itineraries—it was a part of my Borneo experience—but you can also book a homestay on your own. They’re located throughout the state and include a home cooked meal, a chance to interact with local villagers, and another cultural element like a tribal dance performance or jungle trek. Another way you can support the local community in Borneo is by booking day tours through different tour operators to diversify where your money is going. Viator (one of SmarterTravel’s sister companies) is a great place to start: I booked two trips when I was in Kota Kinabalu, the capital of Sabah. One was a short, half-day city tour with a super-friendly tour guide—and I even ended up being the only person on it. This was a great private introduction to the city on my first day. Other tours include a Taste of Borneo Cooking Class, which brought me to a local market with a couple that lived just outside the city center. After shopping at the market I learned how to cook a few typical Kadazan-Dusun dishes and enjoy a homecooked meal. Both tours were excellent complements to my multi-day tour with Intrepid. Even if you’re traveling on a longer tour with a group, you can still add on other experiences. 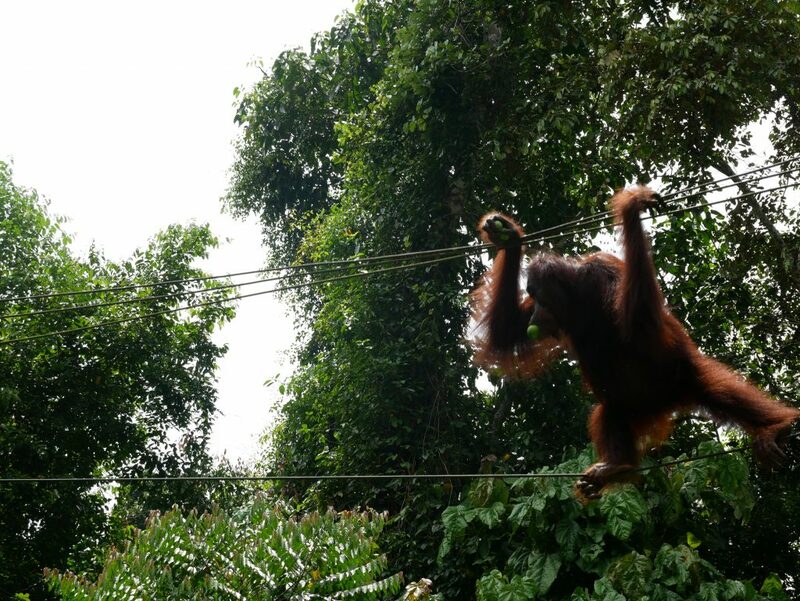 Because I traveled with a responsible tour company I felt like I was helping Borneo in a way. And my group and I were even able to suggest small changes to local leaders and hotels—like enforcing reef-friendly sunscreen on Turtle Island—to help reduce tourist impact in the future. But you can do these things on your own, too, whether you’re on a tour or not. Always travel with reef-friendly sunscreen, even if it’s not enforced, and when you’re on the beach, pick up trash if you can. If you see litter or trash, take a photo and tag an environmental NGO on social media or reach out to them via email. For Borneo, I also educated myself on palm oil (thanks to Intrepid) and began buying products with the RSPO and/or FSC sustainability sticker. Our group was also taught about bird nest collecting and the environmental impact of the trade—and because of this, I avoided supporting it in any way. And while these are tips for Borneo specifically, if you do your research ahead of time you can practice responsible tourism no matter the destination. Ashley Rossi was hosted by Intrepid Travel on her trip to Borneo. Follow her on Twitter and Instagram for travel tips, destination ideas, and off the beaten path spots.